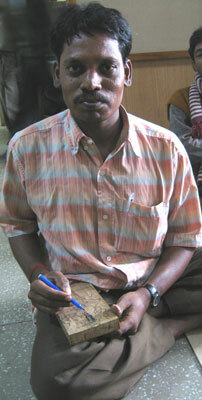 Anbazhgan is a member of The Helen Keller woodcarving group in Kalakurchi in Tamil Nadu. Almost everyone in their village is a wood carver but most do job work for middle men getting paid for the labour but not reaping the benefits of direct sales. The Leprosy Mission ran a project that identified a number of disabled people in the community and encouraged them to come together and form a production group that can make products and sell them directly. The group was then introduced to MESH. Helen Keller Society have handled a number of orders for MESH in the last three years and the members tell us that if they were making pictures for a middle man and being paid only labour rates they would earn half of what they have been able to earn as members of a group marketing directly. In the last year they have suffered losses as one international buyer asked them to use a wood they were unfamiliar with and their lack of knowledge of that wood led to problems with quality. There is still so much to learn.